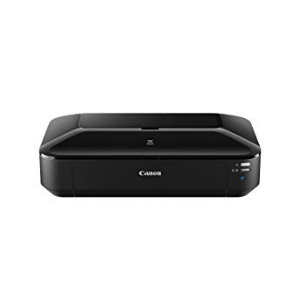 Go Wireless Printing with Canon PIXMA iX6820 is an inkjet photo printer with standard all-purpose ink jet type. The difference between this printer and the other inkjet printers is this printer is using wireless technology. With that being said, you do not need to bother looking up for the matching cable to print your document. This cable and non-cable printer are also armed with Canon FINE technology. Canon PIXMA iX6820 also allows you to print as big as super tabloid paper size. The speed is also impressive. Even using a high-quality setting like Adobe Photoshop 7, you only need to wait for a minute to get your holiday photo on paper. In addition, it is also equipped with water/smudge resistant. With nozzle configuration as many as 5120 nozzles, you can produce with printing resolution as big as 9600 dpi x 2400 dpi for colour and 600 x 600 dpi for black and white. It is also completed with 5 individual ink tanks for its palettes. With Canon PIXMA iX6820 you can print from your PC, Mac, Android, or Apple iOS! The claim for lifetime preservation in dark storage is also just super outstanding! It says you can save your printed photo up to 300 years in dim! Printer Type: IX Inkjet Printer. Features: AirPrint, Auto Power On, Auto Power Off, Borderless Printing, Document Printing, Photo Printing, Full HD Movie Print, Google Cloud Print, My Image Garden, PIXMA Printing Solutions, Solution Templates, Wireless Printing1, 5 Individual Ink Tanks, XL Ink Tank Support, CREATIVE PARK PREMIUM, Quiet Mode. Print Speed (up to): 4 x 6 Borderless Photo: Approx. 36 seconds, Black: ESAT: Approx. 14.5 ipm, Color: ESAT: Approx. 10.4 ipm. Number of Nozzles: Color: 4,096, Black: 1,024, Total: 5,120. Print Resolution (Up to): Color:9600 x 2400 dpi, Black:600 x 600 dpi. OS Compatibility: Windows®, Windows 8.1, Windows 7, Windows 7 SP1, Windows Vista SP1, Vista SP2, Windows XP SP3 32-bit, Mac OS® X v10.6.8 - v10.9. Standard Interfaces: Wireless LAN (IEEE 802.11b/g/n), Ethernet, Hi-Speed USB. Ink Compatibility: PGI-250 Pigment Black XL, CLI-251 Cyan XL, CLI-251 Magenta XL, CLI-251 Yellow XL, CLI-251 Black XL, PGI-250 Pigment Black, CLI-251 Cyan, CLI-251 Magenta, CLI-251 Yellow, CLI-251 Black. Ink Droplet Size: Picoliter Size: 1,2 and 5. Paper Sizes: 4 x 6, 5 x 7, 8 x 10, Letter, Legal, 11 x 17, 13 x 19, U.S. #10 Envelopes. Automatic Sheet Feeder: Auto Sheet Feeder 150 sheets. Paper Compatibility: Plain: Plain Paper, High Resolution Paper, Super High Gloss: Photo Paper Pro Platinum, Glossy: Photo Paper Plus Glossy II, Photo Paper Glossy, Semi-Gloss: Photo Paper Plus Semi-Gloss, Photo Paper Pro Luster, Matte: Matte Photo Paper, Envelope: U.S. #10 Envelope, Chlorine-free paper can be used. Physical Dimensions: 23.0(W) x 12.3(D) x 6.3(H). Find instructions on how to setup the wireless connection on your PIXMA iX6820 printer and also how to reset the printer to factory settings. This allows permitted devices such as your PIXMA iX6820 to connect to your network without needing to enter a password and it enables a quick and easy method of connecting your devices. This method is by far the simplest way of connecting your PIXMA iX6820, so if your access point has a WPS button, please select the ‘WPS Connection Method’ tab below for instructions on connecting using this method. If your router does not support WPS, we have provided alternative instructions to get your PIXMA iX6820 connected, so please select the 'Standard Connection Method' tab below. To begin setup of your PIXMA iX6820 on your wireless network, you must first download the software to your computer. Click here to download. After the file, mac-iX6820 - 1_0-mcd.dmg, has downloaded successfully, double-click it to start the install procedure. Click Next on the first screen. From the Setup List, tap "Web Service connection setup"
Then tap on "Google Cloud Print setup". Next, tap "Register with Google Cloud Print"
Make sure there is enough paper in the printer and then tap "OK"
An authentication page will print out with a URL & QR code. You are now ready to use Google Cloud Print! Finish and Ready for Print!